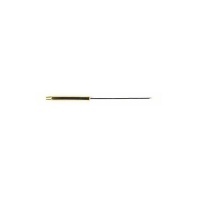 A needle that can be used for the application of varnish or the picking out of dubbing bodies. It also has the added advantage of a hitch tool at one end for tying off at various stages of the dressing. Angled needle for delicate work half hitch tool on other end stainless steel dubbing brush.